Here's what happens when your day job is stuffing dead animals and you decide to try baking fancy cakes instead. 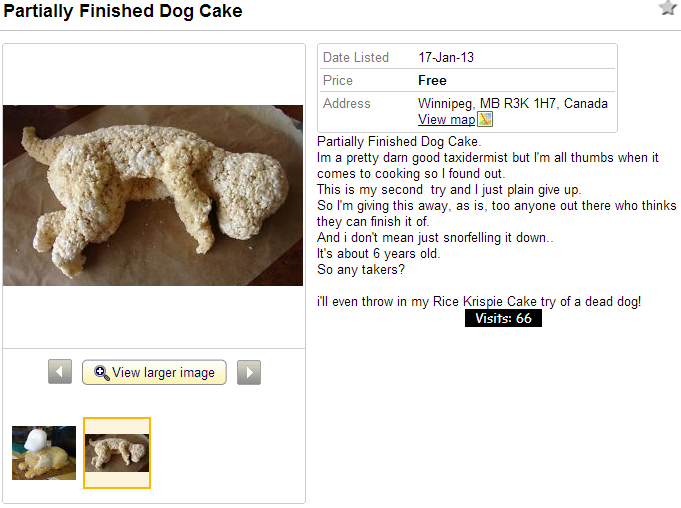 Someone says "don't quit your day job," and you sell the aborted cakes on Kijiji. Like this. Im a pretty darn good taxidermist but I'm all thumbs when it comes to cooking so I found out. This is my second try and I just plain give up. So I'm giving this away, as is, too anyone out there who thinks they can finish it of. And i don't mean just snorfelling it down.. It's about 6 years old. i'll even throw in my Rice Krispie Cake try of a dead dog! Kijiji shut me down. They took all my ads down. Everysingle one.All my animatronics and everything!! !Totally unfair!I mean they were sending me all these emails asking for money to "bump" my ads higher to get more visits. I guess cause I didn't do it they shut me down. Should i call my lawyer.To sign my petition to reinstate ALL MY ADS email me.